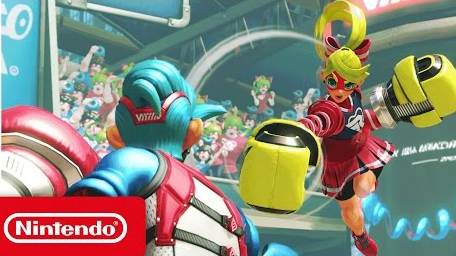 Arms is a Fighting Genre Video Game that was both developed and released by Nintendo, coming to the Nintendo Switch, the newest of Nintendo Gaming Consoles, as one of its first original games in June of 2017. In this game, players can select between eleven playable characters (some of which are obtained as downloadable content) to do battle against each other using a variety of extendable arms within a 3D Arena. Many of the gaming modes found within the game are specifically for a single player; however, the game is also organic compared to other fighting games with its Multiplayer Mode, allowing up to four different players to play at once. 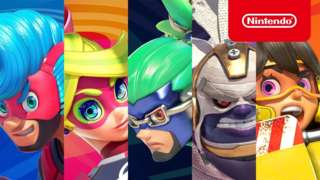 Arms allows players to choose a fighting champion from around the world found within the game, further giving them the opportunity to equip said characters with their choice of a combination of arms. These arms differ from one to the next, and each have a separate ability unique to it. Some arms will send flames a-blazing towards your foe, while some will shock or even blind an opponent. After equipping a fighter with the Arms they desire, players will then be able to battle using a mixture of button pressing and hand motions to take fight to any and all competitors standing in their way. Unlike other basic, standard fighting games, players don't simply just throw punches using the arms they select, but they can also guide many of these shots mid-flight to hit even the most agile of Fighters! Players can even control a character to avoid incoming attacks, as well as springing high into the air to storm down flying fists from way above! And with eight different fighting modes, there is something for gamers of all types! 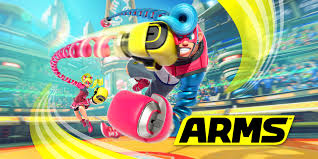 From basic gameplay to descriptions of all the characters and Arms found within the game, from all the different gaming modes to some of the best strategy and tips you'll ever find or need, this guide will be your catch-all when it comes to Arms. Everything that is Arms will be found in this very guide; all you truly need in order to be successful in this newest of Nintendo Sensations can be found right here! So don't forget to not only visit each and every page of this walkthrough - navigation can easily be done on the bottom of each page and through the Table of Contents to the right - but also to subscribe to receive updates so you don't miss any of the new content being added! Get ready to throw some punches to get to the top of the fighting mountain! Be prepared to get into the ring and take some swings! This! Is! Arms! No discussions open for ARMS at the moment.